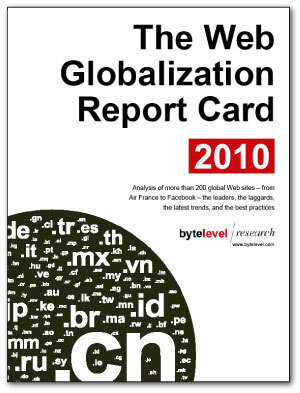 Today we officially kick off a sixth edition of the Web Globalization Report Card. The next four weeks will be devoted to analyzing 225 web sites across more than 20 industry categories. You can view a list of companies we plan to include here. This list will likely evolve as we discover new companies to include along the way. If there are any web sites that you want to see included (no promises, of course), email us at reports (at) bytelevel.com. The Report Card is used by companies not only as a benchmark but as a tool for driving change internally. This means our methodology must evolve with each report. So we’ve made a few key changes for 2010. In 2003, when we produced the first report, only two companies supported more than 30 languages. This year, I expect to see more than 25 companies surpass 30 languages. In 2010, a company needs to support 42 or more languages to achieve a perfect score. And there were will be several that achieve this. User-developed content and social networking applications will also factor into scoring in 2010. This is a big change, but an important one. Traditionally, translation has followed a “top-down” model, in which companies decide which content should be translated and into what languages. And because there are only so many translation dollars to go around, a great deal of content is left untranslated. Now, companies are beginning to leverage the crowd not just to translate content but also to create communities in which content is created in the target language from scratch. In other words, the center cannot hold. Companies that embrace the community — in all countries and cultures — are going to be best positioned to succeed in the years ahead. In 2006, we began evangelizing the four-part approach to global gateways, combining geolocation, language negotiation, visual elements, and ccTLDs. This year, we provide the most detailed view yet of which companies are supporting which types of global gateways. And it’s particularly exciting to see so many companies now using globe or map icons — something we began advocating years ago. Although many companies reduced their web globalization budgets over the past eighteen months, many others did just the opposite. This is what makes this field is so dynamic — and, at times, completely unpredictable. I think you’ll be surprised to see just how many companies have expanded their global presence recently. I’ll keep you posted as we near publication. What’s the world’s most global blogging platform?